Belgium (just like Germany and Brazil) has elections in October which we’ll be reporting on in the coming weeks. The most watched Belgian politician in Brussels however for the moment is not someone who stands any chance of becoming a minister, prime minister or even a mayor (the elections are municipal). Rather, the international press is focusing on Mr Michael Modrikamen, the lawyer and chairman of the little known Parti Populaire (popular party), a political right-wing party in Brussels seeking votes of French speakers in Belgium. Given Brussels’ central location and Mr Modrikamen’s language skills and charm, he is Mr Steve Bannon’s central point of contact for his European project ‘The Movement’, a grouping that aims to bring together populist nationalist parties for the 2019 European elections. 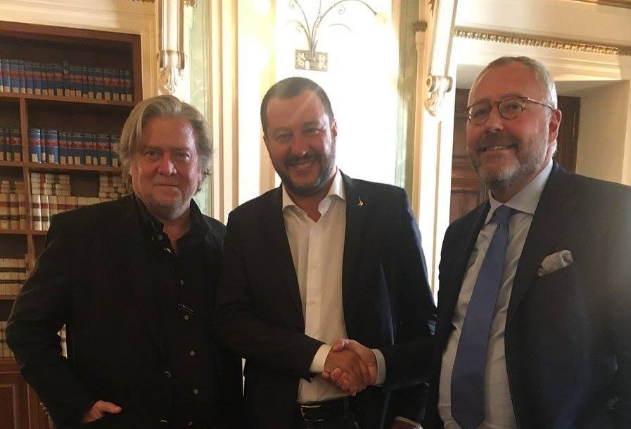 This week they signed on a very big fish who’s agreed to join forces: Mr Matteo Salvini, the Italian Interior Minister and Chairman of the populist anti-immigration Lega Nord could be seen standing next to Mr Modrikamen and Mr Bannon in Rome. ‘The Movement’ now brings together populist parties from Hungary, Italy, Austria, Poland, Finland, Denmark, Belgium and The Netherlands. Already last month, Mr Salvini set up to join forces with Hungary’s prime minister, Mr Viktor Orban, during a meeting in Milan. Both men are reputed for presiding over a crackdown on immigration and championing national sovereignty in their respective nations.